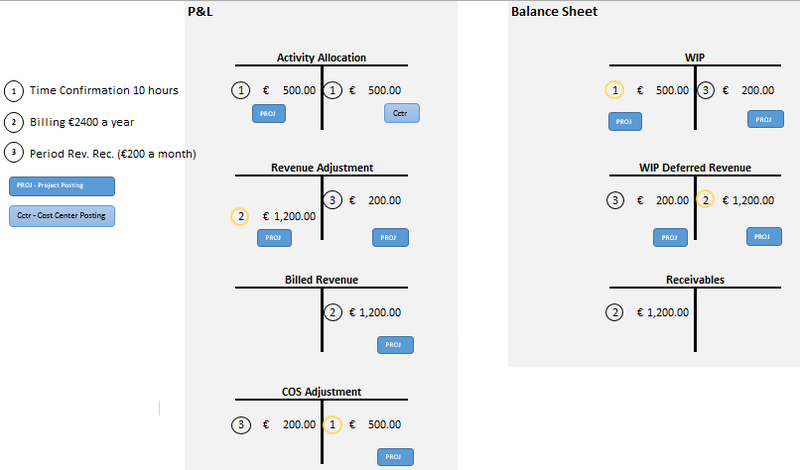 In this blog I will explain the new Event-Based Revenue recognition functionality in S/4HANA 1610. With Event-Based Revenue Recognition, postings to relevant account assignment objects will lead to revenue recognition calculations. The basis for the revenue recognition calculations are all document line items that are assigned to the account assignment object. Processes that do not write a prima nota do not result in any real-time revenue recognition postings (for example, changes of plan data do not directly result in revenue recognition postings). If necessary, period-end closing postings (periodic revenue recognition) will correct the event-based postings. In S/4HANA 1610 only the Sales Project with contract type Fixed Price, Time & Expense and Periodic Billing is supported as account assignment object. Let’s see how Event-Based Revenue Recognition works. In this example I use a sales project with T&M billing and Cost Based POC. The time confirmations are posted as expense and realized revenues are posted based on DIP profile. Invoices are posted to P&L and reposted to deferred Revenue. Sales price for man hours is € 100 and cost price is € 50. The process steps are as below. 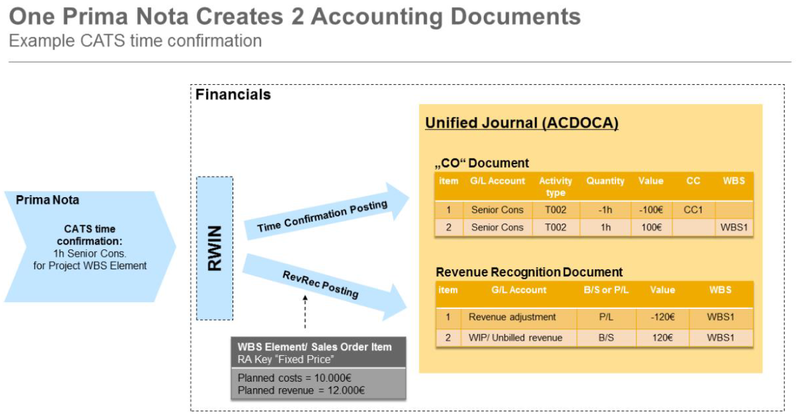 The yellow outlined steps are the postings resulting from the event based revenue recognition. In addition the cost object to which the postings belong are indicated. Confirmations are posted as COS adjustments / WIP. Invoices are posted as realized revenues and reposted to deferred revenues. COGS are calculated and posted based on DIP profile and COGS will post accrued costs. The periodic run recognizes cost and revenues time based on the basis of the invoice schedule / billing plan. The purpose of this new app is to monitor revenue recognition postings and perform manual adjustments. The object list displays all billing elements that are relevant for the event-based revenue recognition with the value posted on the object in separate columns for actual, accrued/deferred and recognized values. It is possible to select one object and drill-down to the details. It is possible to enter temporary manual adjustments through the app. Entered manual adjustments will be cleared again with the next periodic revenue recognition run. Next to manual adjustments it is also possible to enter reserves. Manual Reserves will not be cleared again with the next periodic revenue recognition run. The adjustments have to be cleared manually if needed. 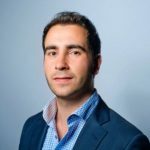 I need some help for Event Based Revenue Recognition . Are you able to help ? In 1709 , can Revenue be recognized for standard sales order ?